I must congratulate you on choosing one of the finest motorcycle rides in the World – “The Great Himalayan Ride”. You would be happy to know that you would be covering about 2200 km of entire Himalayan range at a medium pace and most of your days will be spent on altitudes beyond 8000 ft above mean sea level – and that is beyond normal. No wonder this ride is rated among the most challenging motor-bike ride, anywhere in the World – it would be one of your greatest adventure pursuits. Since this will remain one of the most exclusive experiences of your life, it is helpful to prepare you ahead of time for this very interesting trip. India is different, it is unique, it amazes you at every step and it is a whole lot more. The people, the weather, the traffic, the road sense, lane discipline, even the oxygen in the air, Royal Enfields – are all very ‘Indian’ – a beautiful fusion you would witness in this cradle of civilisation. The uncertainty, some delays, situation based change of plans, traffic and road conditions, is all part of the Indian travel experience. Think of this trip to be a lot more different than your western modern world and be prepared to embrace the un-expected realities of a developing nation. If you are able to do this – you would be transformed and rewarded – you would then be Ready for this trip and have lots of fun. Caution – Please be aware that a lot of changes happen and be flexible in mind to expect and accept the changes in the travel plan. It may start with your flight landing late at Delhi due to air traffic congestion or a mountain pass getting blocked due to heavy rain last night or political situation in Kashmir Valley. Be rest assured your Tour Leaders know the best in the area and will make daily decisions based on lot of factors that change locally, in regions of our travel. The date-wise itinerary and the proposed activities are tabulated below. It is good to have booked the accommodations and camps at least 4 months in advance (these camps are remote and have basic facilities only) as per the program given suggested below. ( 116 km | 5 Hrs ) Ride to the world’s highest pass Khardung La (18384 ft) and then cross over to beautiful Nubra Valley for an overnight joy at an Organic farm. Check in into your beautiful camp at Hunder. 12 A relaxed day in Nubra Valley Today is a relaxed day to explore the Nubra Valley yourself. Dont miss the tallest Buddha statue. Sumur has a nice monastery – Samstemling Gompa. 14 Free day at Leh Today we have another free day at Leh and we could catch up on anything that we did not see. This is also the day for logistic preparations and maintenance of motor bikes. ( 253 km | 9 hrs ) Today is a long day ride. 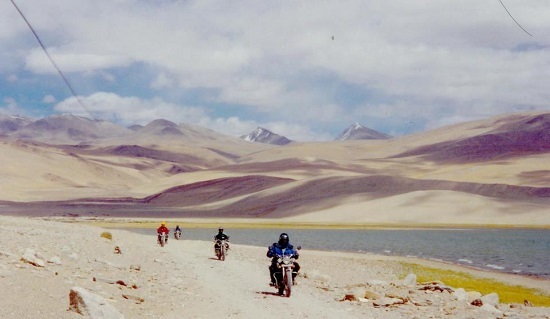 Start your ride early to pass Karu, Upshi, Chumthang, Karzok and reach Tso Moriri by afternoon. Check in into you field camp and a sky gaze at night of stars like never before. Also next morning take a walk up the hill and get some great sunrise views. We ride through yet another high altitude pass of Baralach La before getting to famous Rohtang. After Rohtang the highway gets busy and you begin to see the signs of Civilisation. The tree line returns to the routes. 18 Free day Manali Today is a day to rewind and explore Manali at your own pace. There is Hadimba Temple, Vashistha Lake, old town and some beautiful cafes to see. Enroute you get a glimpse of Sikh history – a visit to Virasat e Khalsa, Anandpur Sahib and a lunch planned at a medieval Sikh Fort, Bharatgarh. Due to snow in the high mountain passes, the tourist season in Kashmir and Ladakh opens up in June and close by end of September. This is also the window when monsoons go to Himalayas. You can expect sunny warm day, a mountain shower of rain, some windy gust and cold passes all in the same day. So there will be hot, cold and wet days on the ride. For sure, you would need sun screens, sunnies, wind cheaters, water proofs, thermals all handy to be used at various places. The weather can be checked on the link http://www.accuweather.com/en/in/leh/359172/june-weather/359172. Delhi would be Sunny and warm with temperatures between 27-41 Deg Celsius. Srinagar would be pleasant and sunny with temperatures between – 14-31 Deg Celsius. Ladakh would be bright and sunny mostly. Temps will be between 10-32 degs Celsius. The traffic is same as Bristish System. We ride on the left of the road and overtaking will be from the right hand side. You need a valid motorcycle licence from your country or an International riding permit. The road and lane discipline has much to be desired, and it pays to take precautions yourself. In the cities and towns that we ride through, there will be unexpected speed breakers and pedestrians and cattle occupying the road. While on the mountain roads there are blind turns and riders need to be particularly careful of opposite traffic. There is unfamiliar motorcycle, a new country, new roads and chaos on them – so take your time to adapt. It would take you 2-3 days to get used to the bike and the traffic conditions – and then we would be in mountains – where it is relatively easier. The roads in the area are mixed bag – there are good roads to pot-holed roads to No roads – and we take them on with smile. – Warm clothing – jacket or pullovers and woollen caps. – Skull cap or Balcalava or hat. – A spare pair of light shoes and flip-flops for moving around. – 6 pair of socks and inner wears. – Spare batteries and memory cards (cameras & mobiles). – Disposable toiletries – shaving kits, paper soaps, tooth brushes etc. – Personal Sanitary needs, wet wipes. – Dry fruits and energy chocolates for personal snacking. – Personal medicines – Avomine, Diamox or for any other medical condition. – Personal woollen gloves for normal wearing. – A swiss knife and pencil torch. – Spare set of spectacles if applicable. Regardless of your profession – we suggest that you begin to get used to riding a motor cycle a month before coming to India. There are motorcycle instincts, skills and senses that need to be awakened for this journey – please begin now. – Cover Srinagar – Leh journey over two days. – Keep your body hydrated. – Avoid sleeping at high altitudes. – Avoid tobacco, smoking, alcohol or other depressant drugs. – Keep your body warm and eat lots of carbohydrates. – Avoid sleep during the day. – Sleep in upright position, if possible. – Carry preventive medicines for Acute Mountain Sickness. – Keep oxygen cylinder handy. – Immediately descend, if symptoms increase. Since most of the places we visit are closer to borders, the access to those places is closely controlled. We would need an inner line permit to visit all the places beyond Leh. At every check point a copy of this will have to be handed over. We would try to get this prepared before- hand for you. It would be good to carry 15 copies of your passport and visa to handover to various hotels and camps. We will handle this for you, if all the documents are sent in advance. It is good to be informed that except for Srinagar, Leh and Manali – the amenities continue to reduce and one should expect lesser of these and more of mother nature- mobile towers, internet network, ATMs or any other facility are very limited or non-existent. We advise that you carry cash and prepare to be disconnected to outside world on a few days. The electricity availability in a few places will be on generator sets – and hence limited. So your charging of batteries will have to be planned well. This in fact is the time to enjoy the solitude and take an inner journey – talk to yourself and be one with the nature – it is one of the most humbling experiences that you would have. Kashmir valley at some times has uncertain political environment. But since tourism is the only lifeline for the valley, every effort is made to ensure that tourist season and inflow is not affected. There are government advisories that would caution you for avoiding this region due to some incidents that happened with foreign tourists 20 years back. Your team leader keeps a close watch on these events and would know of it a few days in advance, and there may be a need to modify the route. While travelling to India – you are in for a very unique experience. The adventure tour that you have opted for is for sure one of the most challenging and rewarding experiences of your life – and it is for the tough ones. You have to rough it out a bit and be open and flexible to accept change in plans and some delays. Be patient and smile at what you see. You have chosen to be on this trip – your smiling attitude will make it a great experience that you would talk about for years to come. And you would like to comeback to see other parts of this wonderful phenomenon called INDIA. Hi,I check your blogs named “Best Advice on Ladakh Motorcycle Ride – Mike’s Good Life Project” regularly.Your writing style is witty, keep up the good work! And you can look our website about love spell.